When designing outdoor living spaces for our Greensboro clients, the custom design depends heavily on the home’s yard size, topography and foliage. 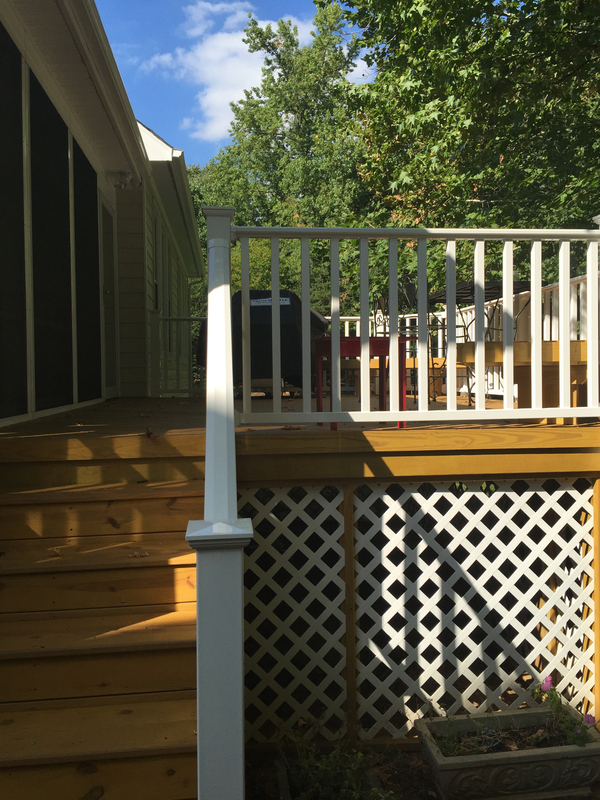 We recently worked for a family that was struggling to spend time outside as their existing wood deck was not usable because of the large number of mosquitoes living on their wooded lot. The family was asking for a screened-in porch, but we were able to give them so much more. 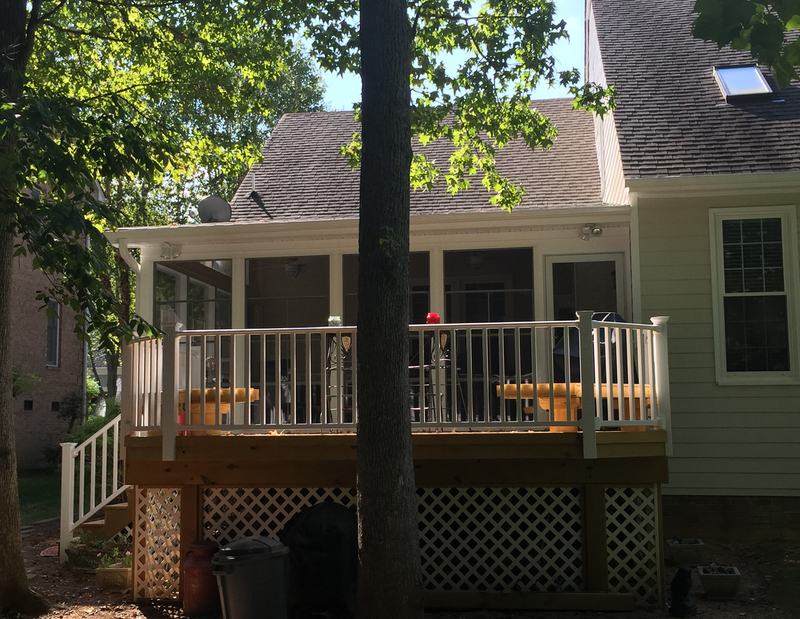 We designed a screened-in porch with Eze-Breeze® windows, a shed roof and a new pressure treated wood deck for grilling and outdoor entertaining. The combination of a screened-in porch and deck makes for a stunning large and versatile outdoor living space that can be used most the year. The translation to a shed roof was part of the magic we’re speaking of. Most porch clients want a gable roof but often a shed roof is required because of second story obstructions such as windows. But, often we propose things like a high shed roof, open shed ends or skylights to bring the bright airiness to the room that they are looking for. 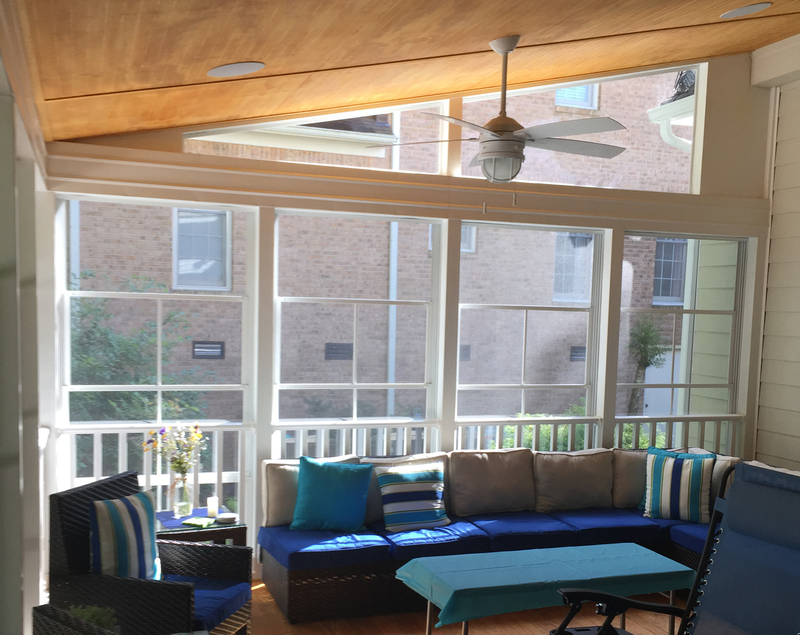 The addition of Eze-Breeze windows to this Greensboro screened-in porch means the family can close the windows completely if the weather is rainy or too cold. With the mild winters in Greensboro, they can use a small space heater and make the room warm enough to use. With gorgeous wood flooring and wood ply-bead ceiling, this bright and airy screened-in porch is warm and inviting. We were even able to install two lighted ceiling fans for increased air flow and four surround sound speakers for the ultimate in entertaining. With no detail left untouched, we made sure to install a ceiling fan with a protected light fixture to prepare for potential game room flying projectiles. Being a Greensboro porch builder, we face many challenging yards. When this happens we really take the time to make sure we provide our clients with the best solution for their outdoor living needs. Living on a wooded lot is a dream with privacy and a gorgeous view. The trade off is living with a few extra mosquitoes. While this family knew they wanted a screened-in porch, they may have not fully thought about the benefit of the open deck for grilling and entertaining. We take great pride in being able to offer practical solutions for every outdoor living challenge, exceeding our client’s expectations.